To pull a prank on your teacher can be quite a risk, unless it is absolutely harmless and non offensive. Take a look at such funny yet healthy pranks to pull on teachers mentioned just for you in the following article. If you really like a teacher in school or college or even dislike him/her to a considerable extent, the one thing you can do is pull a prank on them. Prank ideas aren't supposed to be humiliating and mean. They are meant to be healthy and taken in the true spirit of humor. If you can pull a gag on your friends, parents, siblings, and even strangers, why not your teachers? When you're in the last year of school or college and you've known a teacher for quite a long time, it's only a sense of friendship and acknowledgment that gives you the right to pull a prank on them. 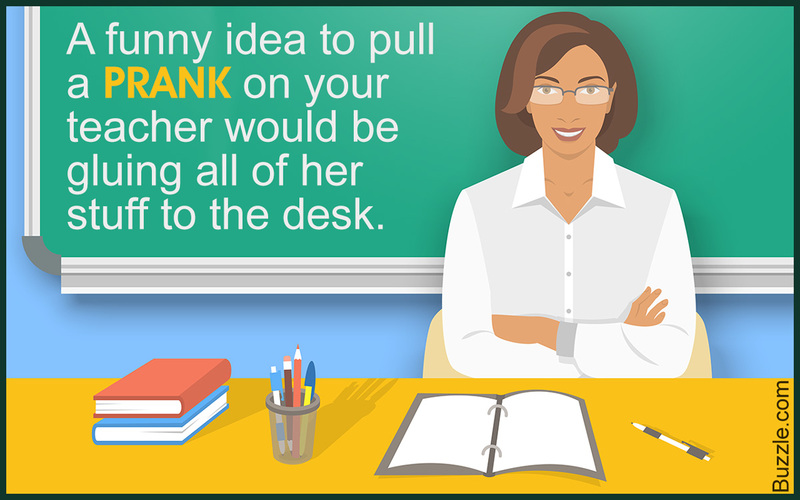 Hence, to keep this lovely informal relationship with your teachers and to let them know that they will always be remembered, here are some hilarious pranks to pull on teachers! Like I said earlier, there are many different pranks, you can choose from, provided you know the difference between humor and humiliation. Before you do anything, make sure you know that the particular teacher has a good sense of humor and does not get offended easily. As teachers expect respect from their students, there is quite a possibility that he/she might not like to be laughed at in front of the other staff and kids. Once you have made sure about all these things, let's have some fun and get ready to laugh! Find out your favorite prank from the ones given below, so take a look! One of the very common ones is the board pranks, where you write or draw something on the blackboard and cover it with the map. You can have a huge, life size image or drawing of a clown or anything scary drawn or stuck to the blackboard and cover it with a map. When the desired teacher comes to teach and approaches the board and pulls up the map, he/she is sure to scream out with shock. One of the students can keep a remote and another one can have the receiver of a fart machine. The one with the receiver can go up to the desk and bend acting like he's dropped something, and the remote person can press the fart button. The teacher will get restless, and you can keep doing this till he/she gets really annoyed. You can do this every time you get up from your place to ask a question as well. This prank is gross, but can be fun! Another common one is the one with the paper. Write something funny on a piece of paper and put some glue on the back side of the paper. Place the paper on the teacher's chair with the side of the glue upside. When he/she sits on the chair, it will stick to his/her back! This prank may backfire if the teacher notices the piece of paper on the chair, so make sure you do it slyly. Get a bag full of fake bugs and keep them with you till the middle of the class. Send a message for that teacher, that there's a call for him/her, and in that time, keep all the fake bugs spread on the table and the chair. When the teacher gets back, he/she is sure to find an unexpected creepy surprise. Enjoy her reactions! If your school or college uses dry erase markers for the board, replace all the markers with empty ones or then fake the chalks that are used for the blackboard. By the time the teacher gets replacements for the fake and empty ones, half the class would be over. This prank can go quite unnoticed and you could still enjoy the reactions. 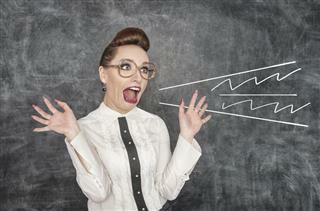 With these great pranks to pull on teachers, hope you have fun making the most out of them. But make sure you don't offend any body's sentiments while doing so and make these pranks a healthy way of enjoyment.